Always fast-moving, filled with lively and exciting songs, and a cool quest story, this one works the whole way through. A pretty excellent film, this one might feature a bunch of puppets, but it’s filled with deep meaning, great songs, clever tactics, fun humor, and a nice story. This is a movie within a movie, as we get the story of the Muppets coming together for a big studio screening of their movie. And that movie tells the story of how they all met, as Kermit and Fozzie took a road trip across the country to make it to Hollywood for some auditions. Along the way, they make a ton of friends, take on an enemy (through multiple encounters,) and find themselves in lots of creative situations. The colors and pacing here, as well as all the celebrity cameos, really help keep this thing on track, and keep us always wanting more. Every song is sang by a different character in a different situation, and you can tell that this movie was really planned and thought out well, to have all this going for it, and for so much of it to work out so well. 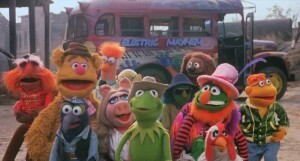 The Muppet Movie is a pretty brilliant piece of cinema. It’s a film that is packed with lively songs and fun moments, but also isn’t afraid to get kind of deep and philosophical. There have been tons of films featuring the muppets, since this one, but none captures the raw beauty and creativity that this movie did. This is the film that tells the story of how all of the muppets came together and met each other. It also tells how they became “celebrities,” and got themselves into the public eye by going to Hollywood to star in movies. There’s so much life and color and energy on the screen at all times, not to mention a ton of fantastic cameos by stars of the seventies. This is the rare movie that was made at that time, and yet still holds up with both kids and adults today. That means you can show this to a room full of kids who watch Marvel superhero movies on a daily basis and are all over the latest technology and dark entertainment, (like The Walking Dead,) and they will still come away loving this movie. Now that’s an accomplishment. And it really speaks to the fact that this movie just has so much to offer. The film does something very smart. 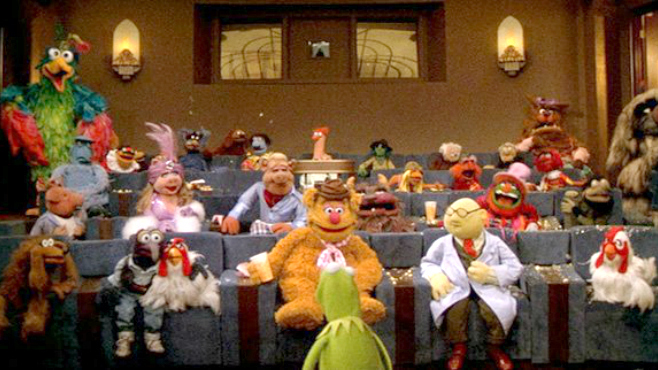 It bookends itself as being about a screening where the muppets are watching a movie about how they all came together. And the movie they are watching becomes the story of the Muppets. So the movie opens with characters driving into a studio lot to park their cars before going up to the screening room. The movie ends in the screening room too. And halfway into the picture, the projector breaks down, and we return to the screening room to check in with the characters who are sitting in their seats, watching the movie there. The mid-movie check in is great, because it reminds us where we really are, and that everything we have been watching is just a movie that the characters are also watching. The movie within a movie idea is really used here to perfection. 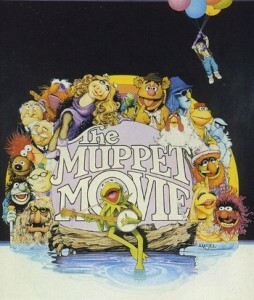 The movie that the muppets are watching begins with Kermit the Frog in a swamp, sitting on a log, singing the Rainbow Connection. Here’s a song that is about dreams. It’s about hearing voices that tell someone they are meant for great things. The Rainbow Connection is the path that will lead to greatness if you just have the courage to pursue it. And that, of course, is not so easy. It means leaving your comfortable life, wherever that is, and aspiring to something greater. In the case of this movie, it means going to Hollywood to make it in the business. This all starts by Kermit getting a visit from a man in a rowboat, (Dom Delouise,) who tells Kermit about an add in the paper that says frogs are wanted for auditions in Hollywood. The man in the boat is attacked by an alligator, and this is where the humor and excitement come in. Kermit rides his bike through a construction site (the frog puppet riding on a bicycle, where you can see the entire body of the frog, is quite impressive, as a puppet trick.) It is at this construction site that Kermit meets Doc Hopper and his assistant, Max. Hopper owns a chain of frogs legs restaurants and wants Kermit to be their spokesman. He makes a handsome payment offer, but Kermit isn’t interested. He can’t help but think of all the innocent frogs who will have to die so that people can eat their frog legs, (Kermit says it as frogs who will be on crutches.) Kermit leaves the site, thinking he’s done with these two, only they’re not taking no for an answer. They continue to follow, spy on, and stalk Kermit. Hopper becomes the main antagonist of the film, leading to a literal showdown in a ghost town for the ending. But before we get there, we have a whole bunch of other characters to meet who will accompany Kermit one his way. The first of these is Fozzy Bear, Kermit’s best friend. Kermit meets Fozzy at a night club / bar called El Sleezo. Fozzy is the stand up comic and singer. He works alongside a piano player and tries to entertain the crowd in whatever ways he can. More often than not, this doesn’t work out so well. When Fozzie gets up on stage to tell jokes, for example, he is heckled by the crowd so much, that he needs to change all his jokes on the spot to make them unfunny, just so that he doesn’t offend anyone. When Fozzie gets on stage to perform a musical number, Kermit jumps up there to help him. The two of them turn the song into a duet and perform it. The whole thing goes over well, and when they announce that drinks are on the house, the crowd runs up to the roof of the building, looking for free drinks. That’s when Kermit and Fozzie make their escape. From there, it’s a series of meetings with one character after another. They stop into a Church and find Dr. Teeth and his band Electric Mayhem playing. The band redecorates their car while Kermit and Fozzie take a nap. Not that the rainbow color car disguise does much, as Doc Hopper and Max still find them right away. Instead of a frog and bear driving a green Studabaker, they spot a frog and bear driving a rainbow colored Studabaker and that’s all it takes. And the movie has some fun with the movie within a movie idea around the meeting of the band at the church. Kermit gives Doctor Teeth the screenplay and the band leader reads it to the other members of the band. We see flashbacks to everything that happened so far, while Kermit and Fozzie sleep. Then, later on in the movie, when Doctor Teeth finds Kermit again, and Kermit asks how he found them, the answer is simple… he just kept reading the screenplay. But the band is just a slight diversion from the real story, which has to do with the meeting of one character after another. They meet Gonzo and Camilla after a car accident. They meet Miss Piggy at a carnival during a beauty pageant. And they meet Ralph the Dog while he is playing the piano at a quiet and fancy restaurant. Some of these sequences are great. The Ralph the Dog, singing the blues situation is fantastic. But others don’t work at all. In particular, the flash forward / daydreaming fantasy sequence between Kermit and Miss Piggy. It is just out of place in a film that is all forward momentum and lively energy. Luckily, it’s about the only sequence in the movie that doesn’t work. Throughout the entire film, the humor and the songs keep us pumped full of energy. The music consists of some truly fantastic numbers, from Moving Right Along to I Hope That Something Better Comes Along to Can You Picture That? And most characters get their own song. Kermit’s is the Rainbow Connection, Fozzie’s is Moving Right Along (although he shares it with Kermit,) Gonzo’s is I’m Going to Back There Someday, Miss Piggy’s is Never Before, and Ralph’s is I Hope That Something Better Comes Along. In changing things up so that each song is not only sung in a new location, but also by a different character, everything continues to feel fresh and different. It’s a very clever idea. The movie ratchets up the intensity between the villains and our heroes as we start heading towards the climax. Doc Hopper brings in a frog killer who has a gun that shoots out a sort of trident spear. Hopper’s friend, Max, begins to have reservations about what they are doing. And the scene is set to meet up in a ghost town with Kermit giving Max the message to tell Hopper that’s where they should meet. Kermit tells the man, he’s tired of running away from bullies and he’s ready to face whatever he needs to. And that ghost town climx does not disappoint. Let’s just say there is one BIG surprise and it’s a whole lot of fun.By the end of the movie, the Muppets pursue their dream all the way to Hollywood and to the office of producer Orson Welles. He’s the cherry on the cake of a whole long string of fantastic cameos, including Richard Pryor, Eliott Gould, James Coburn, Steve Martin, and Mel Brooks. Some of these actors are funnier than others (Steve Martin, in particular, is fantastic,) but they all help add a little something extra to the film. This movie has so much going for it, and is so lively and fun, that it’s a real crowd-pleaser, no matter who is in the crowd.